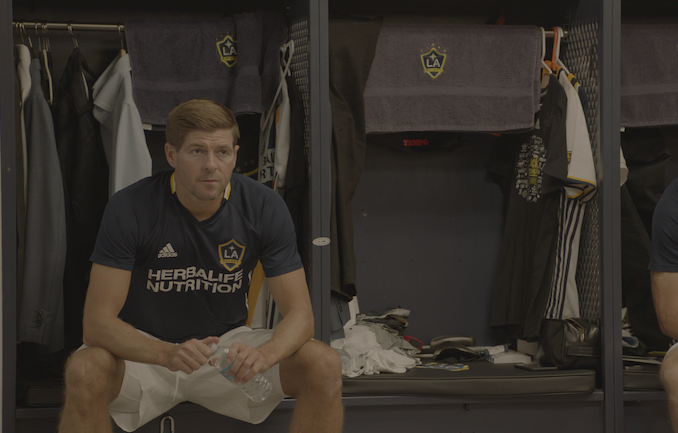 Exclusive Review: Make Us Dream – the Steven Gerrard documentary certainly delivers. Close your eyes and imagine a distant roaring of voices, the sound of thousands of people chanting and applauding. Then the curtain lifts and two things appear: a ball and a foot in a tightly laced shoe on top of it. A name, written on the shoe in bold letters: GERRARD. Who are we talking about? It’s of course none other than Liverpool’s very own Steven Gerrard. The brand-new documentary Make Us Dream covers significant incidents of one of the most legendary careers in football, spanning from his early childhood, to his rise to the Liverpool first team and the turbulent ups and downs he faced playing with that very club: it’s the story of a bigger than life persona and a seesaw between shocked silence and deafening applause. Liverpool was a tough reality when Steven grew up and football was one of those reliefs people found to put their sorrows away for 90 minutes; a window to heaven, and Steven made it his mission to be in that Liverpool heaven. His career in football is well documented from the start. We get to see early footage of young Steven, scoring 12 out of 27 goals at a junior’s match. His mum says of him that he was always laughing, but that probably was for her eyes only because on the early photos he already has that sinister look we’ll later see on the pitch. Comparing the young Gerrard from the photos to the Gerrard on the field, you’re looking at two different people. The pitch is home. Make Us Dream is rich in content; however, the form is slightly dissatisfying. We hardly get to see the captain from today’s perspective. It would have been incredibly interesting to hear him actually comment on the most important moments of his career and share some of his thoughts. In a way, he is surprisingly absent from the movie. Sure, we see all the footage of the past but the Steven Gerrard of the present remains concealed. Also, at one hour and fifty-two minutes of mostly voice over and game footage, the film feels monotonous and it is easy to get lost among the polyphony of largely unidentified voices. Nevertheless, the film grants us a raw look into the life of a larger-than-life figure and shows us how he rose and fell time and time again with a stubborn persistence. In the end, he says that all he wanted was to make people proud. Coming back to the quote in the beginning, I think it’s fair to say that he absolutely delivered. ← Ending the Homelessness Crisis.